Nothing makes me feel quite as old and unsavory as Club Penguin. My friends introduced me to the game sometime in 2006, and it became our obsession for at least a year after. Here were kids who had play dates so we could sit in the same room and play Club Penguin. Maybe my mom would make us lunch, and we’d eat it discussing the exciting events of Club Penguin. And then we’d go home to play more Club Penguin. Friendship is found in the Pizza Parlour. But since everything must come to an end, eventually our enthusiasm began to dwindle. Disney bought the game a year later for $700 million, and we all spent a good while whining about it like it meant the end of the world and as though we knew what we were talking about. The game we loved so much we wanted to have babies with it was selling out to new ownership, and this was clearly the worst thing ever. Nonetheless, I strive to make it tradition to visit the game at least once a year, in time for the annual Halloween/anniversary party. Whether it is to check up on things or just to gather the hats, or to remind myself that this is, in fact, the sixth anniversary, which is five more anniversaries than it should be, I may never know. Anyway, here’s the skinny on this veteran’s revisit to the popular children’s virtual penguin game. My first stop upon loading into town is the local virtual cafe, known simply as the Coffee Shop. Inside, an enormous cake could be found, encircled by colorful balloons, one of which held 2011’s anniversary hat. Clicking a spike in the corner pops them all, releasing the hat so you can add it to your inventory (yes, I had to look this up.) This year’s party hat is an interesting one, resembling not one, but three of the hats from previous years. I wore it proudly anyway. If there’s one thing I learned from this little excavation, it’s what it must feel like to be an old person. That, or Rip Van Winkle. “Your clothes are stupid,” I want to say, to the penguins dressed as heaps of slime with mismatching hats. “That was not nice,” they would respond, using one of the obvious preset phrases the game has provided for them. Mr. Mundy in all his glory. Back in the day, we had to work for our coins, I remember. Now I get checks handed out in the mail like business cards just because once upon a time I may have decided to be a tour guide, or a secret agent. My coins have piled up so much I spent them on worthless things, like a red puffle named Mr. Mundy (“Scout’s Mom” was not available). I decided next to visit the Pizza Parlor, an old favorite place of mine that really got me hooked (“I need a membership, Mom, how else am I going to make pizzas?”). I was greeted by acolorful assortment of players dressed in Halloween garb — spiders, toy cars, princesses in sparkling dresses. Two penguins bickered in the corner over something unimportant. I ordered a pizza and a cup of coffee. “I would like some coffee,” I say. The waiter is wearing a hoodie and jeans, with spiked hair. It does not strike me, at the time, that penguins are not supposed to have hair. He stares at me blankly for a few minutes. “COFFEE,” I say again, slowly. Recognition strikes him, and the waiter nods, donning a green apron and pouring a hot cup of joe from a pitcher that seemingly appeared from his pants. Or elsewhere. I suddenly no longer want coffee. A new waiter walks by, and I beckon to him, ordering a pizza — the house special. To my delighted surprise, this new server begins to round off a piece of dough, tossing it in the air to prepare it for the ovens right at the table. Finally, I think, some service. Folding my flippers in my lap, I watch him and wait for my meal. The table candle strikes an orange glow onto his red feathers. He stops abruptly and looks at me. “Here you go,” he says, smiling and offering me the gooey slab of uncooked, unfinished pizza. “Put it in the oven then,” he says, forgetting he is both the waiter and the chef. “Then it would be cooked dough.” He laughs stupidly, as I pull on my jacket and head out the door into the October evening. Exploring the rest of the island, I find to my chagrin that the Arcade has been remodeled, for better or worse. 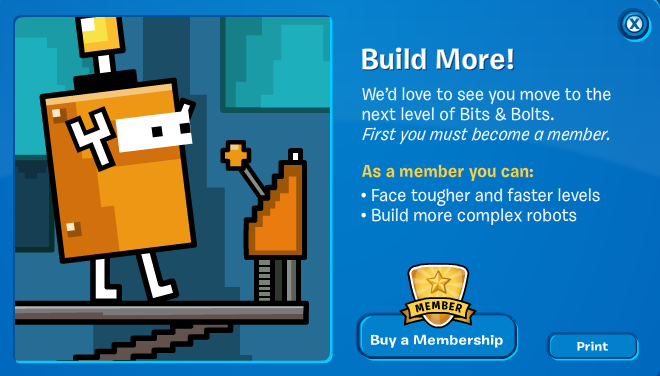 Along with the new setup of tables and floor view opening up to the main night club, a new game has been installed: “Bolts and Bits!” Effective March 2011, according to the Club Penguin blog. Well, at least they bothered adding a recycling bin in the bottom left hand corner of this new lounge room, am I right? The new game tests out only the most mentally sophisticated of players’ skills: adding simple digits to reach given numbers. There are sets of one, two, three, even four, for those of you cruising over the speed limit of life, here. If you’ve gone to kindergarten, it’s very hard to do badly at this game — unless, of course, you do what I did and eventually just start pushing random buttons. Then the game penalizes you by pouring down more blocks, which means more elementary addition problems for you! Someone call my therapist, I think I’m about to have a panic attack. Nonmembers like me can get up to level five on this fun tedious game, where the ball starts rolling, before being ushered over to your score and sent on your merry way. Just how far members can get their gears going remains a mystery. You're given the option to print out this message, which is just as fun as playing the game. The Halloween party also features a ghost scavenger hunt, meriting anyone successful at finding a number of rainbow ghosts around the island a free background, which is nifty in more ways than zero. Additionally, provided you have a super secret Club Penguin code, you can net yourself some pumpkin headgear, seen below, that makes you look so smart, it puts Professor Layton to shame. I want to be just like Wuddleydoo. 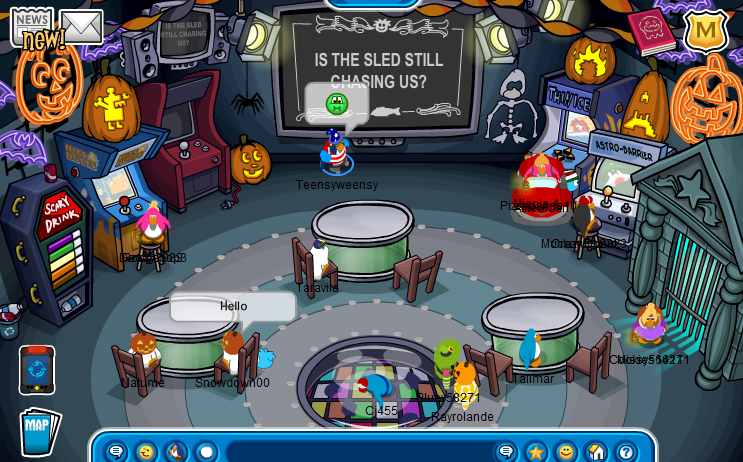 In the lighthouse foyer is a showing of Night of the Living Sled 3, the third installment of Club Penguin’s very own horror movie series. The short film follows the escapades of two penguins fleeing from the “Living Sled,” a Frankenstein-like toboggan which hops after anything it sees. Shockingly the animated short actually was able to capture and maintain my interest, despite the somewhat cliche writing. Why they don’t just set the dang thing on fire is beyond me. 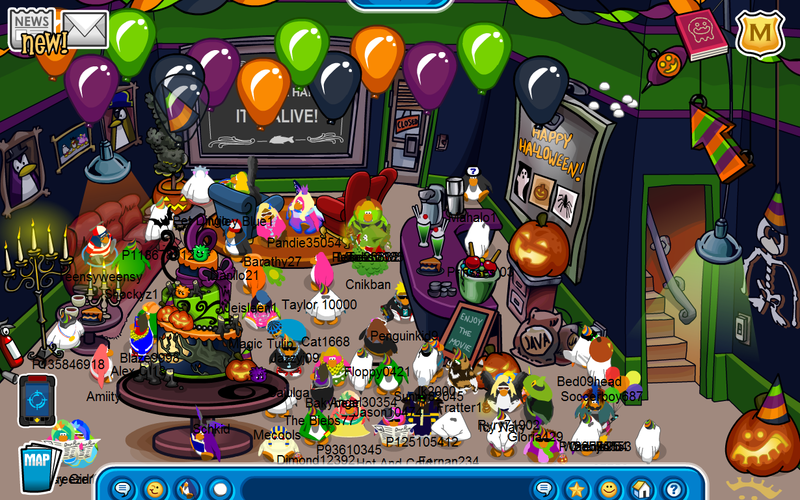 I return to the crowded Coffee Shop to find clusters of penguins screaming for the arrival of one Aunt Arctic, editor in chief of the island’s only newspaper, the Club Penguin Times, and penguin celebrity. 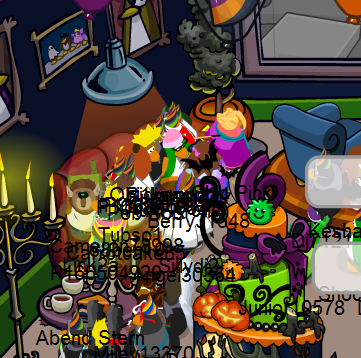 I happen to leave the game on for a while and return to it to find a green bird in glasses and pink cap in the center of the room, surrounded by a mosh pit of virtual avatars all screaming for the bot to add them to her friends list, send them a postcard, or give them a stamp (the Club Penguin equivalent of achievements, essentially). “Smile for Aunt Arctic,” a girl in a dress cheers. I am alone at the counter, ordering a cup of tea. Maybe that’s just me. I’m going to busy myself doing something more fun now. Rip Van Winkle over and out. Hi to every single one, it’s genuinely a nice for me to go to see this site, it contains precious Information.